﻿ Ryad Amiran Marrakech. JIMAT di Agoda.com! Ada soalan mengenai Ryad Amiran? Sesuai untuk berehat dan bersantai, Ryad Amiran terletak di area Medina di Marrakech. Dari sini, tetamu boleh menikmati semua kemudahan yang bandar ini tawarkan. Penginapan ini berada di sekitar kawasan tarikan bandar yang popular seperti Ma Creation, Amazonite, KE'CH Collecive. Ryad Amiran juga menawarkan banyak kemudahan untuk memperkayakan penginapan anda di Marrakech. Penginapan ini menawarkan khidmat bilik 24 jam, Wi-Fi percuma semua bilik, Wi-Fi di tempat awam, khidmat bilik, pengangkutan lapangan terbang untuk memastikan tetamu menikmati keselesaan yang terbaik. Hotel-hotel telah direka demi keselesaan dan memudahkan tetamu. Sebahagian bilik menyediakan internet wayarles, internet wayarles (percuma), penyaman udara, pemanas, panggilan kejut. Rumah urut di hotel merupakan tempat yang ideal untuk anda relaks dan tenangkan diri selepas hari yang sibuk. Apabila anda mencari penginapan yang selesa dan mudah di Marrakech, ijadikan Ryad Amiran sebagai rumah anda seperti berada di rumah sebenar. Lapangan Terbang perkhidmatan pengambilan akan disediakan untuk tetamu yang menempah sekurang-kurangnya malam dan banyak lagi. The only reason I would not recommend this Riad to my friends is that the Riad has a policy prohibiting guests from bringing in their own food and drinks. It would have been nice to be able to have a picnic on the roof deck! Otherwise, the place was great value for the money and a nice place to stay. Nice and cozy place, Nice and helpful staf. We had a nice stay at Hotel Ryad Amiran. There is only 5 rooms and we booked al of them. We had lunch and coffe at the terrace and the food was good. A riad is a mini-palace buried in the depths of medieval alleys that looks like nothing from the outside but inside reveals, usually, what was once a grand private home. 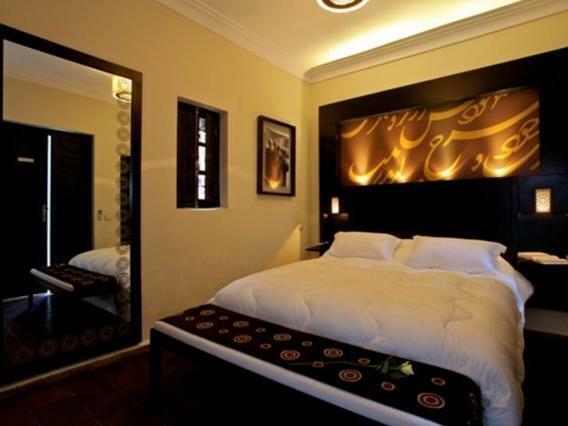 This one has large and comfortable rooms and is well-decorated though not in the traditional mosaic style of many riads. Its on the north west of the medina near Bab Yacout and a perfectly safe and well-signposted walk of about five minutes from where taxis will drop you. Its possible with a little ingenuity to walk from the riad across the medina to the Djem el Fna, at least in daylight. Breakfast was good but we did not eat evening meals at the riad, though many people did and seemed very happy. The owner speaks English and will arrange excursions. It is licensed to sell alcohol - something of a rarity in Morocco. Comfortable bed, decorated very well and large bathroom! 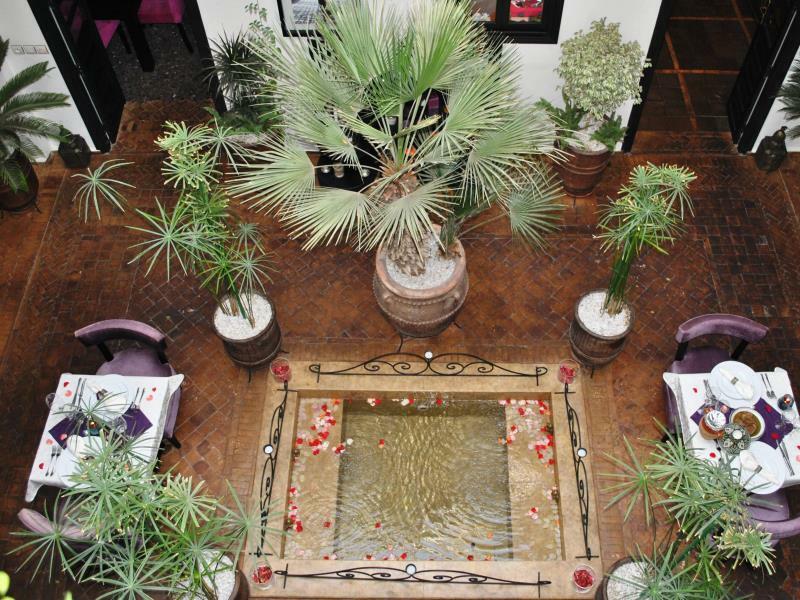 Hotel Ryan Amiran is a very modern Ryad and eels very luxurious as soon as you walk in. The staff are professional and friendly. The ryad is beautiful from the inside and the rooms are very well decorated. The bathroom is huge however our room was a little cosy to be called a Junior suite. Two suitecases fit but not well in the room. The location is very quiet however it feels like a big maze getting in and out of there. We stayed out shopping one night and had to get someone to walk us home as we had no idea how to get back there from the shopping area or the main square. It may have been easier if we caught a cab from the Medina to our area and walked from there. Saying that if its not late at night and you don't want to rush home is a very nice area to look around. The "feel" of the Riad upon arrival, fantastic staff (from Manager to cook), nce rooms. Thanks to the management and staff of Riad Amarin. Quite an oasis in the bustling city of Marrakesh. We were made to feel more than welcome from arrival to departure (during both our stays, a 4-night and a 1-night stay). Service was great (minor hick-ups included that minibar was not restocked daily and the drain in the shower stall did not drain the water on the last night. Also, breakfast cook a bit late from time, causing us to rush one and partly missed another breakfast. Recommendation on shopping, excursions and restaurants can be very well trusted. Hotel services such as transfers and in-house meals a bit costly but of good quality. The Service- The Staff - The Location 3 in 3! This Riad even being back in our own home, feels like home away from home. My wife and I truly loved everything about it, from the Staff, namely Mohammed who was a great joy always very helpful with a smile on his face. He was ever so helpful in getting us into the Riad once we arrived, and always was at hand for any questions in the evening. Amin, the Manager was great, he was prompt with his emails as well as providing with a warm welcome when we arrived, mint tea and buscuits. It was sad to leave this Riyad given we spent a great time here, and the location was very close to the Roads, that it was not difficult to find from being dropped off. For us it was good that the Riad was not too close to the Djma el Fna as having stayed in Marakech before, I knew how noisy and difficult it is to get in and out from you Ryad. Taxis only cost 20-30dhms to and from your Riad and thus it is very little price to pay for quiteness and tranquility which you would definitely get at this Riad. A sevice with a smile as I remember this fondly. We were also given a place to watch the Champions League Final too, all in English as well, this was truly service with a capital S. I would definitely recommend this Riad, which is like a 5*hotel, it is very new and feels so homely. it was love at first sight. 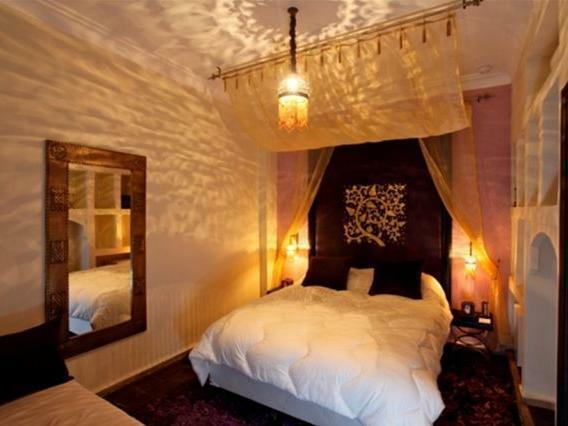 the riad is cozy yet gorgeous. traditional morracan design, with a modern touch. from the first moment we stepped in the riad, the service was amazing. the owner was there to welcome us, offer us information about the city, arranged necessary transport, etc. he even arranged a romantic meal for us on our last meal, cooked by their in house chef (delicious!! highly recommended). the room was clean and beautifully decorated. the rooftop is nice as well- good place to chill out, or have your breakfast. and free wifi throughout the riad! cons: a bit noisy at night, but i'm not sure if that can be avoided in the medina. also, a bit far from the main square (15 min walk, or can take a taxi). Rooms are a little small but well equiped and modern with oriental elements in decor (like on hotelpics), lovely patio. Everywhere there are rose petals...Very friendly stuff, good breakfast. My husband and I stayed here for four nights in the Amethyst suite. We have travelled all over the world but have never felt happier than at Ryad Amiran. Mohamed, Fatima-zhah, and Amin made us comfortable and provided fantastic recommendations for restaurants and hammans. We celebrated my birthday during our stay with drinks in the stunning courtyard. Free wi-fi, a sumptuous French breakfast included, and a haven of calm inside the hectic medina. We give this Ryad ten out of ten! 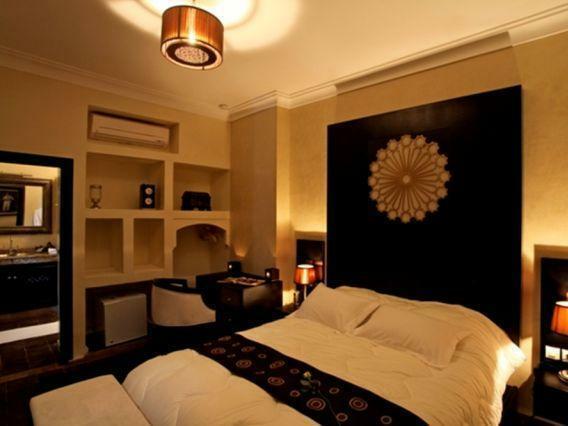 Wonderful contemporary yet Morroccan decor, warm and welcoming staff and best bed in Morrocco! Our 2-night stay in Ryad Amiran totally spoiled other hotel/riad stay for us. Although the Ryad was slightly further in the Medina from the Place Jemaah el Fna, it was still within walking distance. What was outstanding are the rooms, which were very cosy, welcoming and beautifully decorated. The beds, quilts and heater made it a welcome respite after a day's shopping in the souks. Furthermore, staff like Amin, Fatimah, Noor and Mohamed went out of their way to fulfil our wishes. The owner also took the time to meet us. Only 5 rooms, beautiful traditional decor. they made us feel very welcome and they were happy to help with anything - gave us tips on what to do during out stay. the breakfast was amazing! traditional moroccan breakfast. i would recommend it to any visitors. Der Besitzer sowie sein Familie haben keinen Wunsch uebrig gelassen. Adil, der besitzer kann perfekt Englisch und Deutsch. Wuerde auf jeden Fall wieder hin, wir waren wunschlos gluecklich. Danke nochmal Adil!